This is a fabulously cool idea…. I just love it!! I found this awesome bubble wrap craft over at Givers Log. 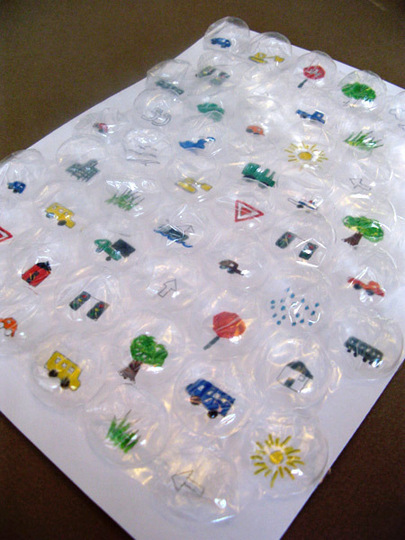 Here she uses bubble wrap to create this fun activity that kids have been doing for years…. hopscotch. 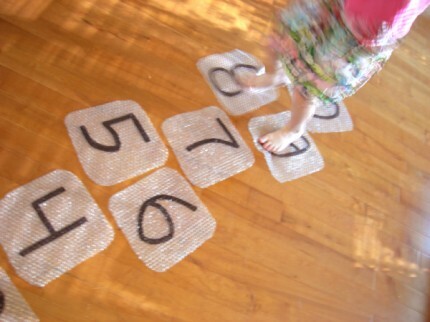 What child doesn’t love jumping on bubble wrap… now there is plenty of chances to do just that. Bubble Wrap is a great medium to paint with. Bubble wrap has tons of cuts and grooves giving this fish a bunch of texture. 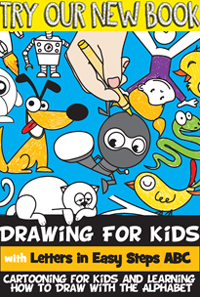 Make sure to check out Free Kids Crafts to get all this crafts details. Check out these beautiful Greeting Cards…. and for each of them bubble wrap was used. I found this bubble wrap craft over at Creative Jewish Mom… and as she says, she is very creative. In this post she shows you how to make Rosh HaShana Cards with bubble wrap. 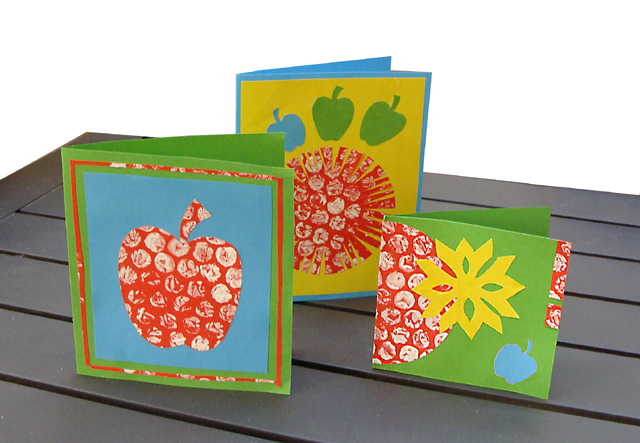 Keep in mind with this technique you can make any greeting card you wish. I found this really cool site that in order to help teach children the letters and the sounds they make they integrate the letter of the week with a sensory experience…. 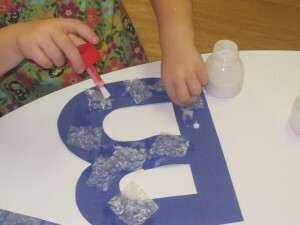 in this case they used bubble wrap and glued it to a letter B to help teach the children the Letter B and its sound. Check out Teach Preschool for all the details. Here is one of our posts that we made a few months back. 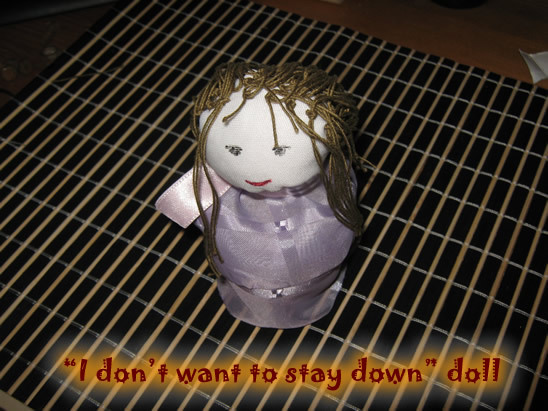 Here we used bubble wrap to make a “I Don’t Want to Stay Down” Doll. This doll is a traditional Romanian Toy. It is called a “Hopa Mitica” Doll and it won’t stay down no matter how hard you try…. it keeps popping back up. Check it out to make one for yourself. Here is a creative way to use bubble wrap….. Create Bubble Wrap Bingo. Using the large bubble wrap Apartment Therapy shows you how to make this awesome Bubble Wrap Travel Game. Make this craft and carry it in the car for long trips…. the kiddos can pop the bubbles every time they see one of the items. Check out the site for all the crafting fun. This is a great way to have children paint…. after all look at the great texture bubble wrap and the rolling pin create. This is such a great idea. 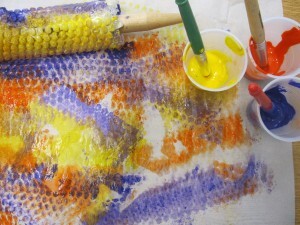 I found this bubble wrap craft over at Teach Preschool and it looks super fun to me. Imagine all the great paintings your kids could make. Check out the site for yourself. Aren’t these butterflies just simply magnificent? And, they are made from bubble wrap…. which of course makes them perfect for this post. Teaching the Little People came up with this idea and it is such a great one…. she points out how making Bubble Wrap Butterflies are a perfect way to teach your little ones the letter B. Check out her site for all the details. These bubble wrap snakes are sssssssssoooo…. cute!! They are fun, colorful and they even spring to life. I found this bubble wrap craft over at Fun Art 4 Kids and I love it. 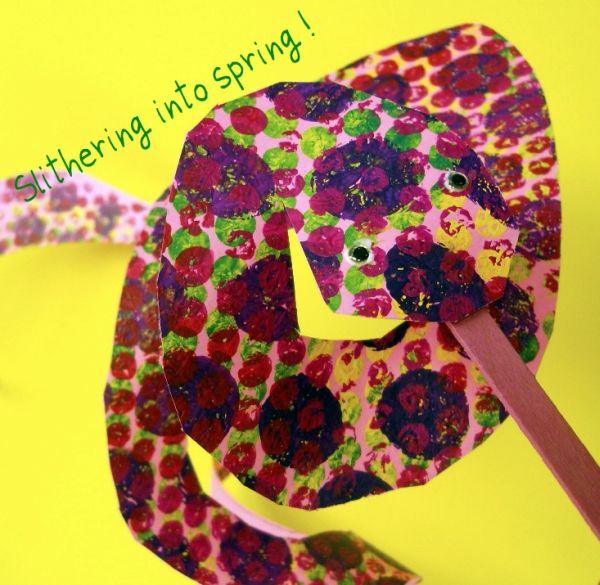 She used bubble wrap, paint and a popsicle stick to create this springy snake. Make sure to check out her site to get all the details. 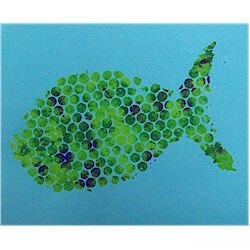 Here is another bubble wrap craft that is from our site. We showed you this craft last year just in time for the Christmas Holidays. 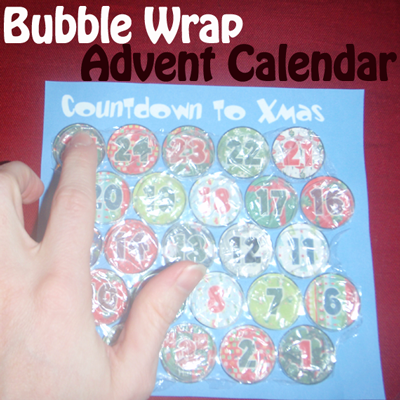 In this particular post we showed you how to make an Advent Calendar out of Bubble Wrap. What better way to count down to the Holidays than to do it with a advent calendar you made yourself. Make sure to check it out. This bubble wrap craft has got to be one of my favorite bubble wrap crafts I found. Just look how adorable these crocs are!! I found this super creative bubble wrap craft at Positively Splendid and it is pretty incredible. 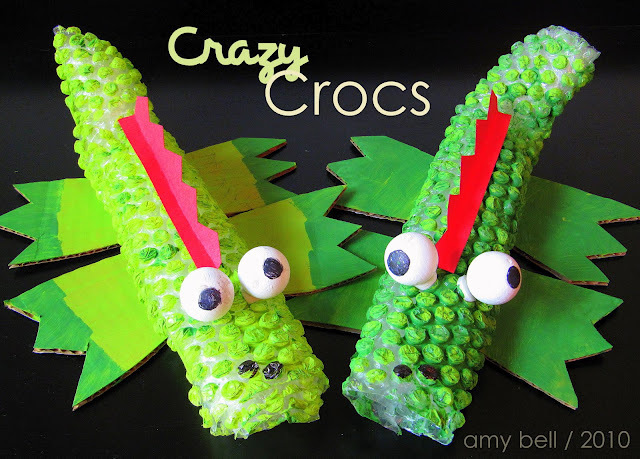 Amy at Positively Splendid shows you step-by-step how to create these bubble wrap crocs so check it out for yourself. Look how amazing this bubble wrap corn looks…. it really looks like Indian Corn. I found this bubble wrap craft at Parents and it looks like a lot of fun. 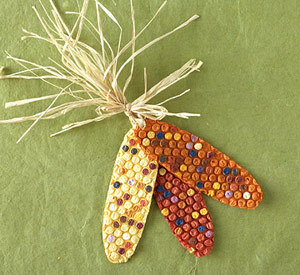 This bubble wrap Indian Corn makes the perfect decoration for the Thanksgiving Holiday. Make sure to check out the website for the step-by-step tutorial. Here is a super duper creative way to use Bubble Wrap. 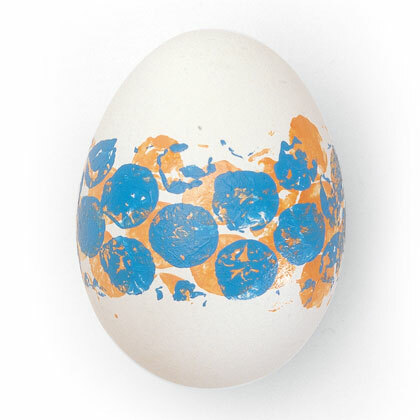 Use Bubble Wrap to dye an egg. I would have never thought to do this…. but Family Fun did. They will show you how you too can make your Easter Eggs using Bubble Wrap. Cool idea!! 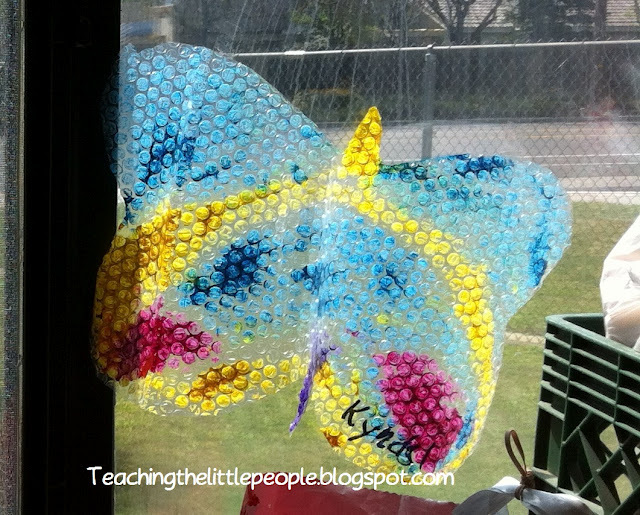 Thanks so much for including our Bubble Wrap Butterflies in your Bubble Wrap post! There were so many fun ideas here!